Syon House and Gardens at Syon House and Park020 8560 0882work Historic HouseDescribed by John Betjeman as the 'Grand Architectural Walk', Syon House and its 200-acre park is the London home of the Duke of Northumberland, whose family, the Percys, have lived here for 400 years. Originally the site of a late medieval monastery, excavated by Channel 4's Time Team, Syon Park has a fascinating history. Catherine Howard was imprisoned at Syon before her execution, Lady Jane Grey was offered the crown whilst staying at Syon, and the 9th Earl of Northumberland was imprisoned in the Tower of London for 15 years because of his association with the Gunpowder Plot. The present house has Tudor origins but contains some of Robert Adam's finest interiors, which were commissioned by the 1st Duke in the 1760s. The private apartments and State bedrooms are available to view. Described by John Betjeman as the 'Grand Architectural Walk', Syon House and its 200-acre park is the London home of the Duke of Northumberland, whose family, the Percys, have lived here for 400 years. Originally the site of a late medieval monastery, excavated by Channel 4's Time Team, Syon Park has a fascinating history. Catherine Howard was imprisoned at Syon before her execution, Lady Jane Grey was offered the crown whilst staying at Syon, and the 9th Earl of Northumberland was imprisoned in the Tower of London for 15 years because of his association with the Gunpowder Plot. The house can be hired for filming and photo shoots subject to availability. Within the 'Capability' Brown landscaped park are 40 acres of gardens which contain the spectacular Great Conservatory designed by Charles Fowler in the 1820s. The House and Great Conservatory are available for corporate and private hire. The Northumberland Room in Syon House is an excellent venue for conferences, meetings, lunches and dinners (max 60). The State Apartments make a sumptuous setting for dinners, concerts, receptions, launches and wedding ceremonies (max 120). Marquees can be erected on the lawn adjacent to the house for balls and corporate events. The Great Conservatory is available for summer parties, launches, filming, photoshoots and wedding receptions (max 150). No photography in house. Indoor adventure playground. Plant Sales Garden Centre. Suitablity for the Disabled: WCs. Guided Tours: By arrangement. Suitability for Dogs: Guide dogs only. 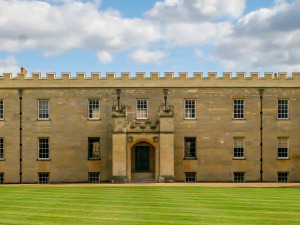 Syon House: Mid-Mar - End of Oct (see website for dates), Weds, Thurs, Suns and BHs 11am-5pm, last entry 4pm. Gardens only: Mid-Mar - End of Oct (see website for dates) Daily 10.30am-5pm, last entry at 4pm. House, Gardens and Great Conservatory closed from end of Oct - Mid-Mar yearly. By Bus: 237 or 267. Trains: From Waterloo to Kew Bridge, then a bus as above. Underground: District line to Gunnersbury then bus as above.